Late last year the South Western Ambulance Service’s charity arm asked if Pewsey Community Area Partnership (PCAP) would help raise funds for a “Raizer Chair” for the areas volunteer Community First Responders team (CFR). After reviewing the information provided we decided this was a worthwhile project that would benefit local residents directly. 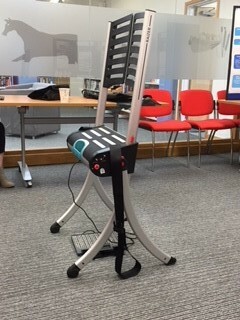 Three months later and we have successfully funded not one but two Raizer Lifting Chairs for the CFR Team that covers the Pewsey Vale and its villages. The funds have come from the Wiltshire Council Pewsey Area Board Health and Well-Being Fund- £2,000, The Friends of Savernake Hospital – £2690 and a dozen or so local Parish Councils contributed over £1300. I would like to take this opportunity to thank everyone for their support. The Raizer Lifting Chair is a state of the art, battery operated mobile lifting chair that helps a fallen person up to an almost standing position within just a few minutes. Raizer can easily be assembled and operated by one assistant and does not require any physical effort besides a supportive hand. Who is most at risk of falling? The South Western Ambulance Service covers one of the most rural areas of the UK and are committed to providing the population of the South West with the highest standard of out-of-hospital care. But during busy periods they have to prioritise calls and falls in the home where there are no obvious injuries, sometimes have a long wait. SWAST are extremely grateful to the many Community First Responders who volunteer to help members of their local community in their time of need. SWAST do provide support and training for CFRs as they value the support service they offer. Every day, Responders from across the South West attend emergencies within their local communities. Sometimes the difference is providing reassurance prior to the arrival of an ambulance; sometimes it is saving someone’s life. Our own local Community First Responders are volunteers who support their local community by attending emergency calls ahead of an ambulance. As the first on the scene they may help to decide the urgency of the call. Some falls in the home are not deemed a priority when the service is busy and under pressure which happens more and more. So they have identified that this equipment will be very useful in saving an ambulance calling where the patient only requires assistance getting up as they have no injuries. In any event I am sure the person on the floor would rather be off it sooner rather than later! Don’t forget this can be called out to residential care homes as well as sheltered housing facilities.